Preheat oven to 400°F. Place chicken in a large bowl. Microwave frozen cheesy rice & broccoli according to package directions, then add to the chicken. Mix in 1 cup of shredded cheddar cheese. Open one tube of Pillsbury™ Crescent dough, unroll and split into two long pieces, then pinch all of the diagonal perforations together. Lay crescent dough on a large, parchment-lined baking sheet or pizza pan, in a large round wreath shape (with open center). Gently press the dough flat as needed. Spoon chicken mixture on top of crescent dough round, using clean hand to form the filling into a little mound all the way around the crescent dough. Leave about 1/4 inch of dough showing on edges of ring. Open the second tube of crescent dough. Unroll, split into two long pieces, and pinch the diagonal perforations together as before. Gently lay the long strips of crescent dough over the filling, then pinch the edges of the bottom crescent dough and top crescent dough together on both sides. Brush milk over the top of the crescent dough. Sprinkle with sesame seeds. Bake for 18-24 minutes, or just until the crescent dough is golden brown. Remove from oven, top with tomatoes and a bunch of parsley for a holiday flair. Serve, slice & enjoy! Pimp out your holiday table with this Cheesy Chicken & Broccoli Crescent Wreath. It's festive and so entirely edible. Which makes it edibly festive and festively edible. Or, shall we say fedible? Estive? Festividible? Ah, heck. Let's just stuff this puppy in our mouth, make a toast to fabs food, and not say a thing! Line up the ingredients! You can have these things all shopped for and sitting in your fridge and freezer, awaiting the exact moment when your holiday bakeage strikes. To get this thing baked up and in your face, it's seriously so easy. Just mix the filling together. Chicken. Cheese. Green Giant Cheesy Broccoli and Rice Steamers. Bam! Now open a tube of Pillsbury Crescent dough, pull it in halfsies, pinch the diagonal together, then mold it into a flat round on a parchment-lined baking sheet or pizza pan. Mound the filling on the dough, leaving about 1/4" of crescent dough open around the edges. Mound the filling on the dough, leaving about 1/4" of crescent dough open around the edges. Open the second tube of crescent dough. Unroll, split into two long pieces, pinch the diagonal perforations together, then place over the top of the filling. Pinch the edges together. Brush milk over the top layer of your crescent dough. Sprankle it all up with sesame seeds. Toss some over your shoulder for good luck. Congrats! You'll be married in a month! 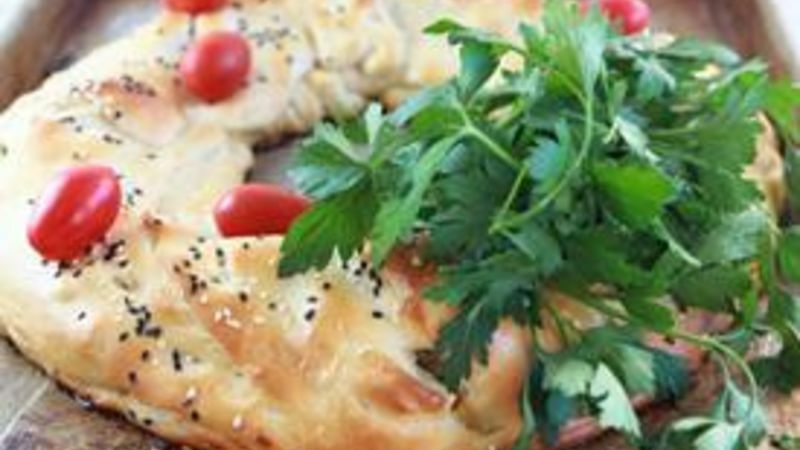 Bake and top with cherry tomatoes. Decorate your wreath right up with a little bunch of Italian parsley to add some easy holiday flair. You know, hlair. It's a thing. Serve and slice for the ultimate easy, fedible party eat. Happy Holidays!